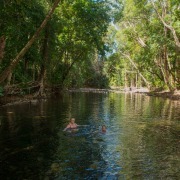 They have National Parks Permits to all areas in Daintree / Cape Tribulation / Cape York / Atherton Tablelands / Mungana (Chillagoe) / also permits in other areas of Queensland. Custom built 4WD vehicles (maximum 16) have been designed for passenger comfort and to withstand some of the ruggedness required in the areas that they operate. The vehicles are high clearance which means when conditions are wet we can still get through, extra large viewing windows, spacious seats, extra leg room for maximum customer comfort. They also provide baby and booster seats, all seats are seat belted. 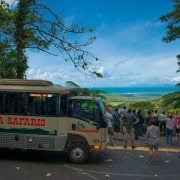 All drivers are local accredited guides which means they have years of local knowledge and experience specialising knowledge of history, local aboriginal culture, all aspects of flora and fauna and in depth knowledge of our World Heritage Rainforest and Outback. 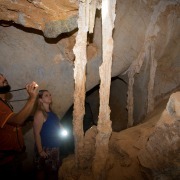 Chillagoe Caves & Outback including Granite Gorge and Aboriginal Rock Art! 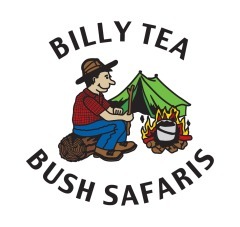 Billy Tea Safaris is a small locally owned operator. 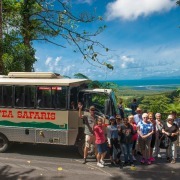 Custom built 4WD vehicles with a maximum 16 passengers per vehicle. 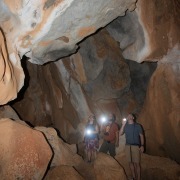 Naturalist guides have extensive knowledge of flora, fauna, history of the area and aboriginal culture.